The professional way to determine building moisture, wood moisture and relative humidity. 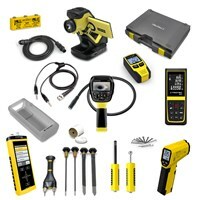 Here you will find an optimal set of building diagnostics kits. Our measurement kit include components such as infrared camera, T3000 multifunction instrument, various sensors and electrodes.